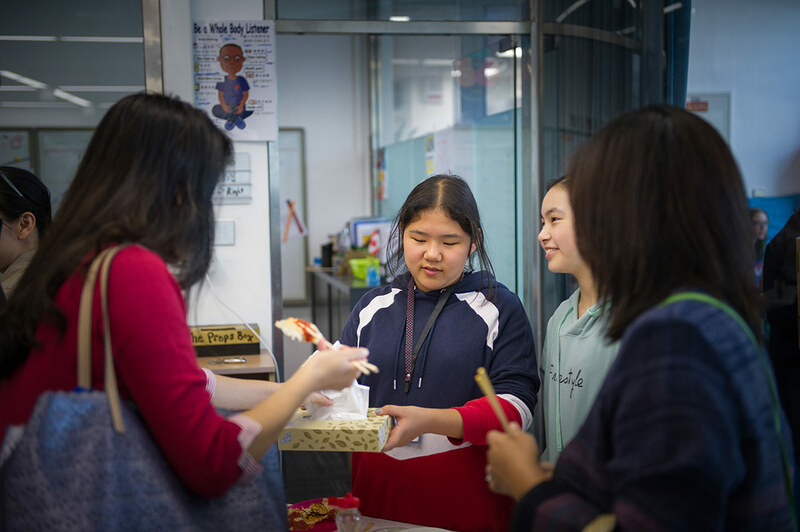 The Middle School (MS) at the International School of Beijing (ISB) was bursting with creativity recently as students were challenged to learn new skills for Make It Week. Last Friday, they exhibited the results of a concentrated, five-day project that saw them design and make products of their choice. 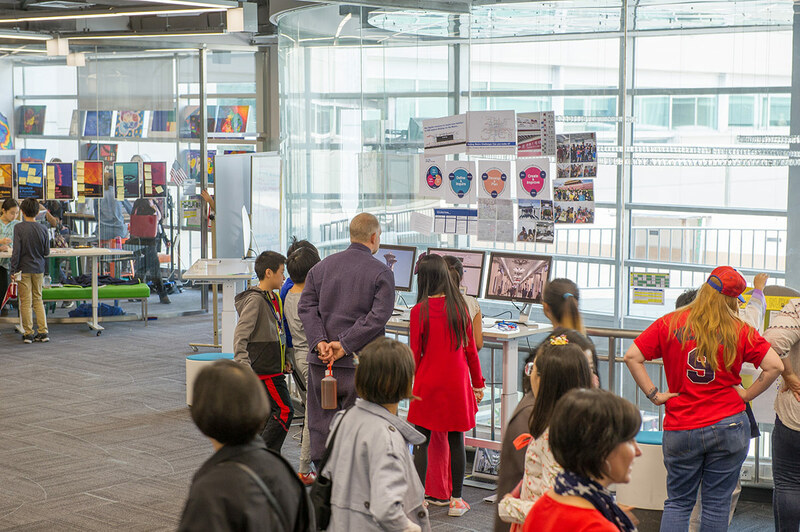 The Futures Academy resembled a mini world's fair as students showed off upcycled plastic items, unusual musical instruments, videogames designed and programmed themselves, and far more. This is one of the highlights of the year in the Futures Academy, where the various types of learning experience include classrooms, project-based learning, design challenges, experiential opportunities, fieldwork in local communities, and online collaboration with experts and professionals, such as architects, artists, musicians, and engineers. Make It is one of three "Ignite Weeks" throughout the school year. The second, Express It, focuses on arts and communication, while the third, Personalize It, asks students to pick a personal project advancing what they have learned in the first two weeks. In each case, they are guided by specialist teachers from departments including EdTech and Performing Arts. 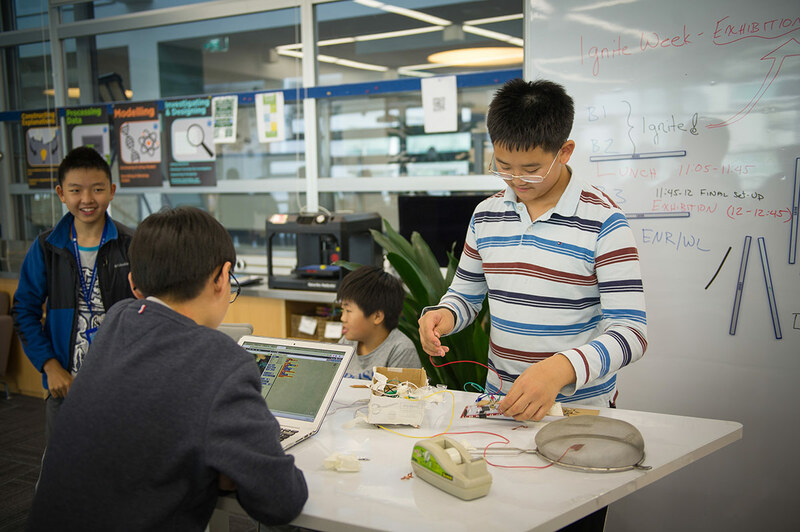 The weeks take advantage of ISB's world-class facilities and abundant tech resources, with young designers honing products with laser cutters in the Fabrication Lab and mastering all sorts of programs on their laptops. "Make It Week is based on upskilling and learning to make something," said Kelsey Giroux, MS Futures Academy Program Coordinator. "It's all about learning something that we can build on through the rest of the year. As a community, we start to have students skilled in different areas, which really helps for major project work." At Friday's Ignite Exhibition, Make It Week participants told us what they learned in the five days of productivity. "We had many projects to choose from, and I chose Top Chef. The teacher gave us one secret ingredient – this time, it was butternut squash. We had to put squash in everything we made. "The dishes we thought of were ravioli, pancakes, and soup. The soup, we made out of carrots, onions, potatoes, squash, and celery. The meat in the ravioli is chicken, and there's butternut squash and potatoes, tomato sauce on top and butternut squash seeds. For the pancakes, we put squash into the dough and we fried squash, sugar, and cinnamon to make the filling. "The thing is, butternut squash is sweet, so it's hard to make savory things. I learned communication, creativity, and mainly cooking skills. It was a really good experience." "This is basically a record player, it plays music. Touching the copper tape around the rim of the wheel plays specific notes. We had the bike wheel and we sourced the wires and everything. "I learned how to make a circuit, and that you can use everyday objects to make something really cool. 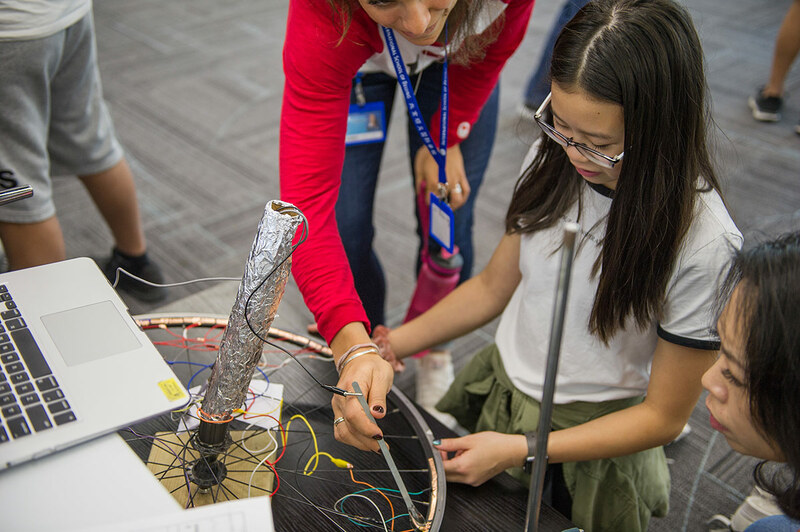 On the first day of our Ignite Week project, we experimented with playing a piano – you can just use aluminum foil and some wires and your computer, then you have a homemade piano." "First, I came up with a game featuring a wizard shooting a fireball at a dragon. But after trial, it seemed like the wizard was not cool enough, so I changed it to a knight who can throw swords. I also added a lot of Easter eggs, so various secret features are activated by pressing certain keys. "S" activates a shield that can block attacks, for example. "The question we kept asking ourselves was "Is this game functional? Is it fun to play?" We didn't want our game to be one of these cheap web games, so we added a lot of programming. Now, we plan to test the game with other groups and improve it. "I learned that the first idea you have is usually not the best idea. My first circuit box did not work well – the connections were not good, so I changed it. If you run into a problem, you have to fix it." 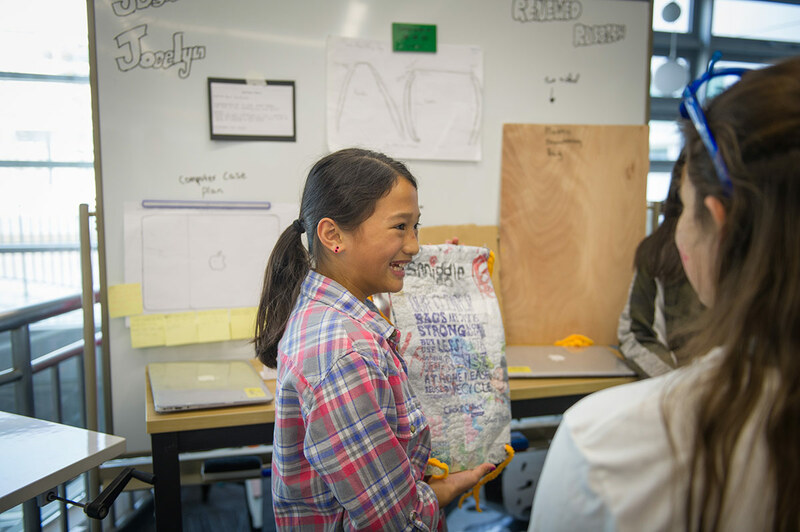 "We made this bag entirely out of old plastic bags that we found. We ironed it with wax paper on top to avoid directly touching the plastic with the iron and melting it. Then we had to sew it all together. We made the drawstring crochet because otherwise if you pulled it, it would break. It's also more comfortable to wear. "A computer case was our original idea. It failed because we realized we couldn't make the tiny holes to fit the cables through. Our inspiration for the new idea of a plastic bag was one of the videos on Preciousplastic.com. It showed how to make a grocery bag – we adapted it into a drawstring bag. "Making this single bag took us a total of about a day. We'd like to make more and sell them. "We learned about recycling, that it's possible to make something amazing from nothing more than plastic bags. I now constantly pick up plastic bags – as long as they're clean because we don't want to sell people dirty plastic bags with mud on them!" "We made a subway resource for new families coming to ISB that will help them to get around Beijing in a more convenient and cheaper way. We went on a field trip to get an idea of what the Beijing subway is like. Coming back, we started putting what we'd learned into this resource – a blog with many sub-sections like attractions, sporting venues, and restaurants that reflect Beijing's culture. We have given clear explanations of which line to take to get there, which station to get off at. "It was a team effort. I mainly focused on making videos. I started filmmaking last year, and I feel like my photography skills have improved a lot. "We'll now figure out how to share this. Maybe we can send it out in parent WeChat groups." To learn more about Futures Academy in the Middle School, click here.